It is with great sadness and sorrow we announce the death of our fellow crew member Ravi Singh Bisht. Ravi was part of the Carnival Cruise Line team since 2012, working in the Culinary Arts department. He sadly passed away onboard the cruise ship Carnival Horizon on August 11, 2018. Ravi leaves behind his family and his beautiful fiancée. They were engaged in July this year, just before Ravi joined the cruise ship for another contract. The news was first reported by Cruise Hive saying that the Indian crew member in his 30’s lost his life. The website adds that an anonymous source from Carnival Horizon said that his death may have been linked to a Crew Galley party he attended the night before. Ravi Singh Bisht was found dead the following morning while the cruise ship was docked in Grand Turk. Some sources say that he died from a heart attack. Carnival Horizon departure from Grand Turk was delayed 2 hours due to the crew member passing away which was not related to the propulsion problems. It is with great sadness that I must inform you of the passing of one of our team members, Ravi Singh Bisht. Ravi was born in Jaipur and began his career with us in 2012 in the Culinary Arts Department. He will be remembered as a hardworking and passionate team player who always had a positive attitude. He was well-liked by all who knew him and he will be greatly missed. 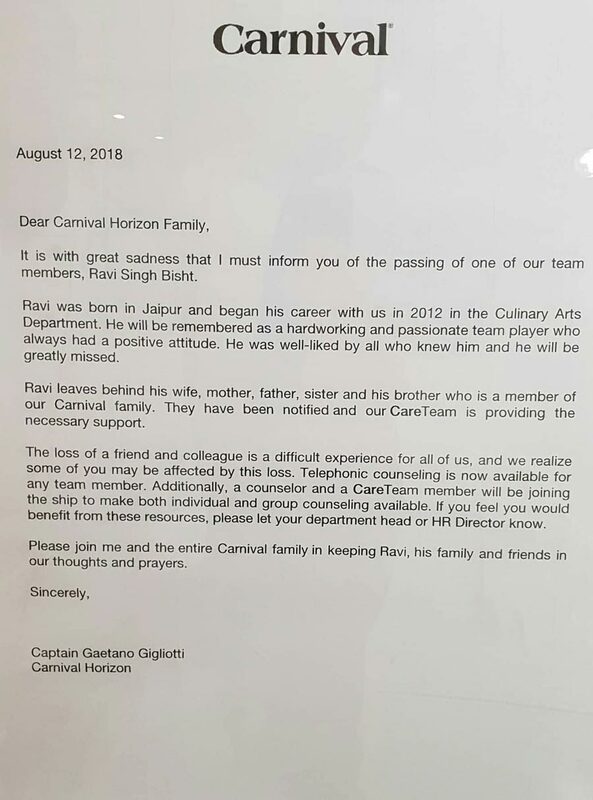 Ravi leaves behind his wife, mother, father, sister and his brother who is a member of our Carnival family. They have been notified and our CareTeam is providing the necessary support. The loss of a friend and colleague is a difficult experience for all, and we realize some of you may be affected by this loss. Telephonic counseling is now available for any team member. Additionally, a counselor and a CareTeam member will be joining the ship to make both individual and group counseling available. If you feel you would benefit from these resources, please let your department head or HR Director know. Please join me and the entire Carnival Family in keeping Ravi, his family and friends in our thoughts and prayers. The above announcement says that Ravi “leaves behind his wife” which is probably a mistake because he was not married but engaged. Our thoughts & prayers go out to his family, friends, and coworkers. Rest in Peace Ravi.